Scientists working at CERN have found four new “tetraquark” particles comprised of the same four subatomic building blocks. These exotic particles don’t last very long, and they probably don’t play an important cosmological role, but the discovery reveals the surprising diversity of the tetraquark family. This isn’t the new fundamental particle that we’re all waiting for, but it’s a fascinating finding nonetheless. 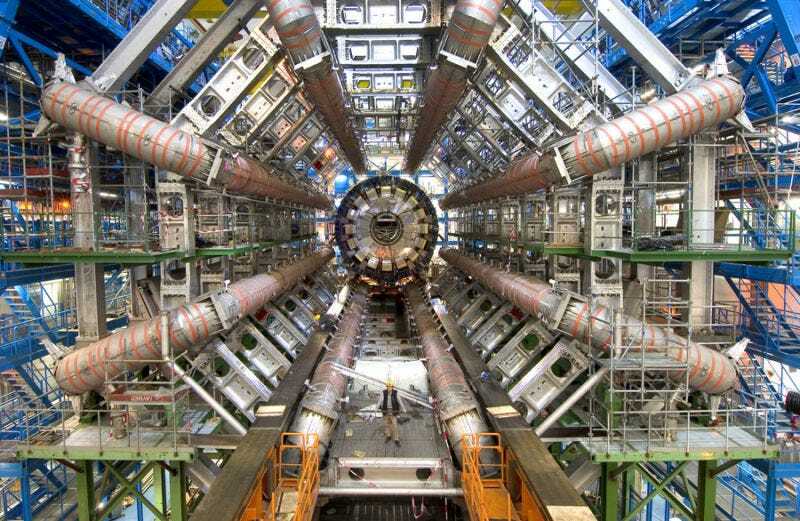 Researchers working at the Large Hadron Collider beauty (LHCb) collaboration have confirmed the existence of an entirely new four-quark particle, known as tetraquarks, and three new tetraquarks that had never been seen before. First proposed in 1964 by physicists Murray Gell-Mann and George Zweig, quarks are a series of charged subatomic particles that form larger particles like protons and neutrons. They’re the smallest known components of matter and are considered the basic building blocks of the universe. For a time, scientists figured that quarks only came in varieties of two or three, but recent discoveries have revealed “exotic” configurations of four and even five quarks (called a pentaquark). The four new members of the tetraquark family have been named according to their respective masses, which is measured in mega-electronvolts: X(4140), X(4274), X(4500) and X(4700). Each of them contain two “charm” quarks and two “strange” quarks (both of which are heavy quarks), and they’re oriented in a unique way. It’s the first time particle physicists have seen four-quark particles composed entirely of heavy quarks. Importantly, each of these exotic particles feature a distinct quantum number, which describes its subatomic properties. “Even though the four particles all contain the same quark composition, they each have a unique internal structure, mass and their own sets of quantum numbers,” explained the researchers in a news release. The CERN researchers had seen X(4140) before, but its re-appearance in the data now affirms its presence as a bona fide tetraquark. The other three exotic particles, X(4274), X(4500) and X(4700), were seen for the first time, so further observations will be needed to confirm their existence. The newly discovered tetraquarks are highly unstable, and they decay quickly into other particles. They probably don’t play an important role in the large scheme of things, but further research into these exotic particles could shed further light on big quarks and how they interact. The two new papers that describe these findings are still subject to peer review, and they’ve been uploaded, here and here, to the arXiv pre-print server. This discovery certainly look promising, but we’ll learn more about this finding next month when particle physicists gather in Chicago for the International Conference on High Energy Physics.